What a thought provoking title. When you think about the subject and what both of these competitors have is a lot of the same thing. iOS has been around a bit longer than our green friend, and has had the majority of the great apps for some time. But now we see a lot of great games, and applications being ported and created for the Android platform. There is still one major difference – Root. The ability to access the phones hidden data, change files, swap themes, etc. And what makes this so powerful in the everyday market aspect, is the fact that the Android Market supports such applications. Where as our detractors devices must be jailbroken, then use a separate program called Cydia to use their device to its full potential. Widgets, custom icons, full themes, and installing non App-Store apps is all available once jailbroken. Isn’t it great to have all that made easy with Android? For example – The #2 app on the Android Market is ROM Manager. (Cheers Koush!) Following ROM Manager is a great assortment of Root Access apps. Including #9 Titanium Backup, #7 Set CPU, and #3 Root Explorer. Compared to the list of the top ten iOS applications, it could be presumed that users of the iPhone aren’t concerned about these types of things. Their list is filled with nothing but games. See for yourself after the jump. So comparing these lists you see a few things. Apple users love them some games. Android users love utility applications, and making their phones very powerful tools. Do you feel it would be a completely different story if Apple allowed for easy jailbreaking and allowing users to switch up their phones? 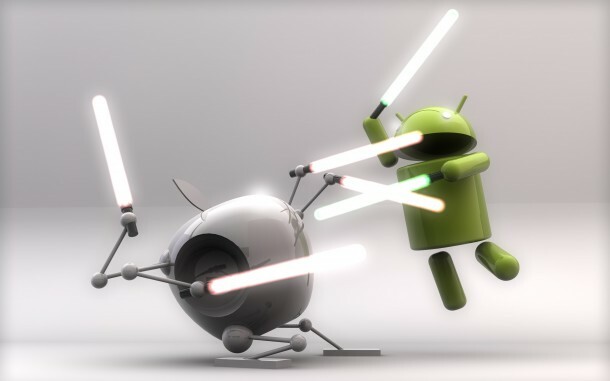 Is this what truly makes Android the more powerful “Smart Phone”? You tell us. We felt this was a great way to compare the two.